With the current semester just about over, next years application essay questions will be posted in the coming weeks for many schools. Round one applicants should start figuring out their story and crafting their essays. 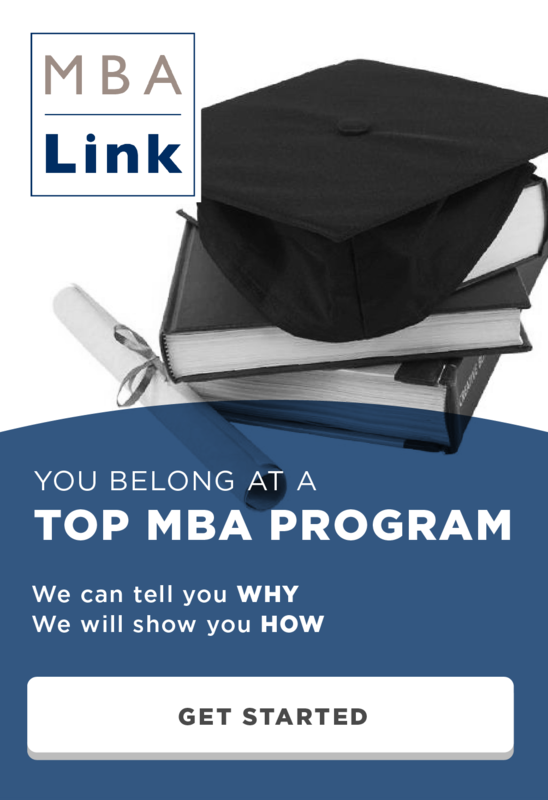 The most important essay for most schools is the question: Why get an MBA and why is [insert school name here] the right choice for you? In order to answer this question you need to have a plan for how an MBA is going to help you achieve your goals. The vast majority of MBA students are looking to switch careers. Why else pay $120,000 in tuition and give up two years of salary? If you wanted to stay in the same industry, you would probably just go for a promotion or switch companies. I was curious if the industry an applicant is trying to transition into impacts their MBA acceptance rate. My theory was that there are a lot of people trying to transition into consulting, banking and technology, so there may be oversupply for those concentrations. Perhaps a candidate would stick out if they are pursuing a more unique career. I took the business school admissions data from GMAT Club and looked at the acceptance rate by stated concentration. First I decided to look at the top 20 schools in aggregate, to ensure the results were statistically significant. 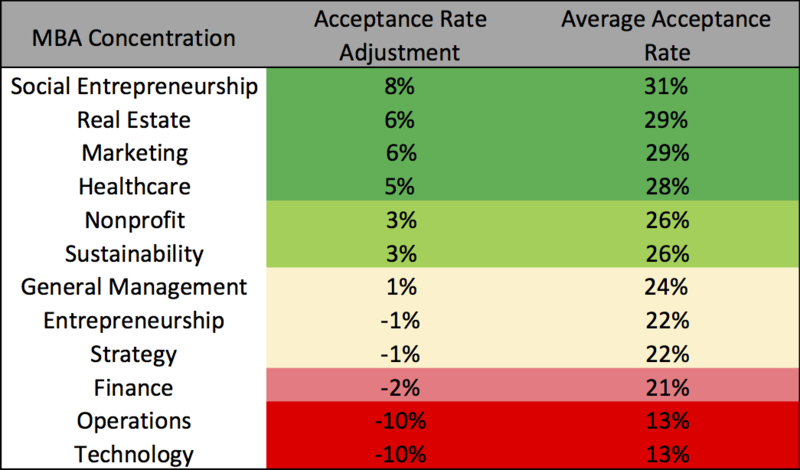 I was surprised by how much the acceptance rate varied depending on MBA concentration. The average acceptance rate for top 20 schools is 23%. Many of the concentrations towards the top are fairly small with the exception of Marketing. As you can see, there is a huge range in the acceptance rates based on industry focus. With Social Entrepreneurship applicants 2.5 times more likely to be admitted than applicants interested in Technology or Operations. Most of the results don’t surprise me, business schools seem to be trying to help the world right now, so it is no shock that Social Entrepreneurship, Nonprofit and Sustainability are all in the top half. With the crisis in the Healthcare industry, the high acceptance rate for Healthcare applicants is also logical I am a little surprised that Real Estate is so high and Technology is so low. There is not a lot of focus on Real Estate that I have seen in business school, so I didn’t expect it to be the concentration with the second highest acceptance rate. On the other hand, Technology is very hot right now, so it is shocking the admissions rate is so low. Since this data does not have gender included, it is possible that the acceptance rates are skewed by gender concentrations. More women tend to focus on Nonprofit, Social Entrepreneurship, Marketing and Healthcare, which could have bumped up the acceptance rate. Many schools are trying to increase their female enrollment, so women tend to have higher acceptance rates. At the other end of the spectrum, industries such as Operations and Technology are more dominated by men, which likely led to the low acceptance rates in those concentrations. In the end, I wouldn’t recommend outright gaming the system. Don’t say you want to pursue Social Entrepreneurship rather than Technology if Tech is really what you are passionate about. It will likely show in your application. However if you are unsure of what you want to focus on, it would make sense to chose the concentration you are interested in that has the highest acceptance rate. There was a lot of variance by school. The chart below shows some of the highest and lowest acceptance rate concentrations by school. Take these findings with a grain of salt because the sample size is pretty small. *This concentration had a very large increase or decrease. This entry was posted in Admissions, Anderson, Booth, Columbia, Darden, Emory, Fuqua, Harvard, Johnson, Kellogg, Kenan-Flagler, MBA, McCombs, Ross, Sloan, Stanford, Stern, Tepper, Tuck, Wharton, Yale and tagged Admissions, Anderson, Application, Columbia, Cornell, Darden, Duke, Emory, Harvard, Industry, Kellogg, MBA, McCombs, Ross, Sloan, Stanford, Stern, Tepper, Wharton, Yale on May 17, 2015 by Data Guru. This is an awesome post. I have to admit I met so many people interested in social entrepreneurship. However, I bet only 10% of them will actually go into that field, since we all need to pay off our loans. If I had to re-apply to all the top schools, I would say social entrepreneurship by far! I wish I could do social entrepreneurship, but like you say we have student loans. I did big brother before I started and I plan to volunteer for New York Academy of Science, mentoring kids in STEM this year. I wish I could do more but there are only so many hours in the day. I wonder if this is a result of overcrowding effect and schools try to keep the ratio of these. Jesus Christ, this is an absolute bombshell! I feel like I owe you several filet mignon dinners! Absolutely invaluable information! Next time you are in NYC I would be happy to take you up on that. Best of luck with applications!